Last year I showed you photo after photo of beautiful apples that were all picked from our trees here on Apple Hill. It was such an amazing surprise because we just didn’t expect such beautiful apples from totally neglected trees. Turns out, maybe neglect was the answer. This past winter, we pruned the trees. This past spring, we fertilized the trees. And this year, this is what our apples look like. Yes, we know about dormant oil spray…Maybe next year we’ll try it. No, it’s not time to hire any laborers yet, but the two old trees in our side yard have picture perfect apples on them for a couple of old codgers (not us, the trees…). They are so close together that the red and the green apples mingle for a wonderfully random effect. The most beautiful apples are always high above our heads. We got out the ladders! They’re small, and a few have scabs, but there are surprisingly few worms! We can eat them whole (not the worms!) –always the sign of a good apple! Neighbor Betty reminded us that there are two other trees on the wild part of our property line (near Our neighbors, the cows) so we have to check them out this coming weekend. I’m hoping they are Macs–my all time favorite apple. 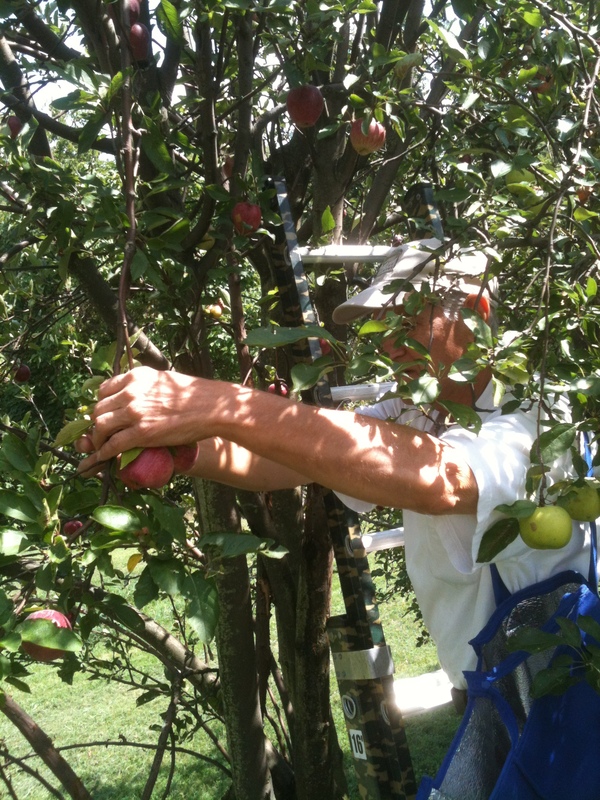 Here is our harvest–not quite enough for a bushel basket, but there are still plenty of apples on the trees. 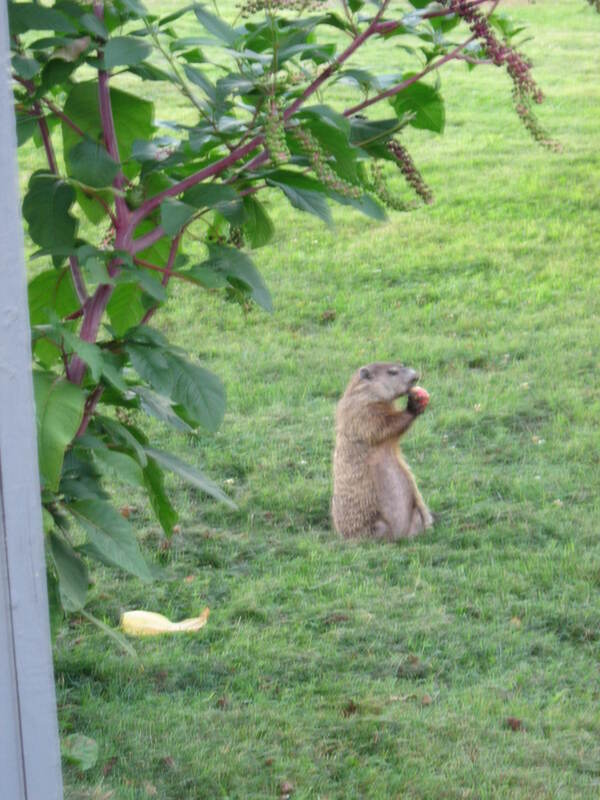 We are not the only ones who love these apples–you saw the deer a few posts ago–this week I finally got a photo of Gus, our elusive groundhog. He’s so deliriously happy while eating these apples that he forgets to run away when I get out my camera. He eats one under the trees, then picks one up and takes it down into the woods. For lunch? For a mate? I took four shots of him, but this one is the best. I only had my IPhone camera with me on the porch and this is as zoomed as it gets. (After the fox appeared, we set up a tripod on the porch with Michael’s nice camera on it.) Before he got to the sunlight, he took a left into the woods. 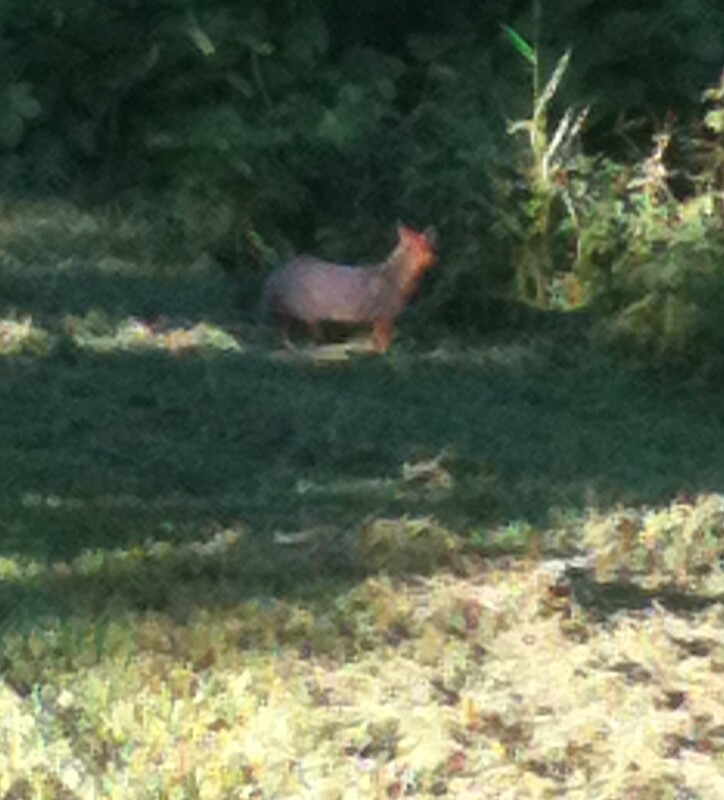 Mr. Fox was not interested in the apples; Michael had just mowed, and I think that’s what brought him into the field. 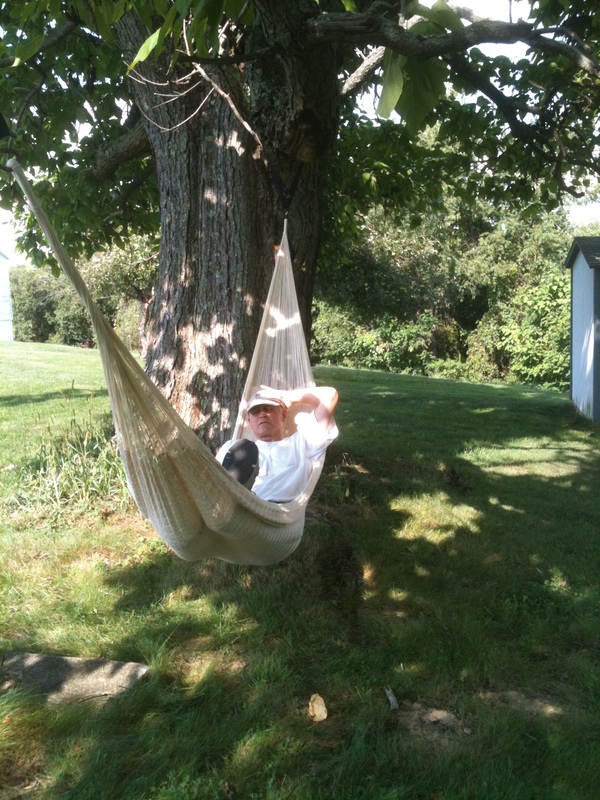 we’re trying to savor these last days of summer…You do the same!